Realtime Gaming launched an entirely new kind of casino game today and Grande Vegas Casino is one of the first to have it. 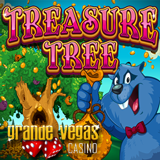 The new Treasure Tree is a match & win game from RTG that's unlike any other game in the full-featured online casino. It's a fun new kind of game that's generous with free games and pays up to 500X the bet. Until the end of this month you can get a 125% up to $125 casino bonus to try it. To claim the Treasure Tree Casino Bonus enter coupon code PRTTREE when you deposit. This is an exciting, easy-to-play game where you place a bet and then select Money Bags from the branches of a magical tree to reveal either prizes or free games. If you get three of a kind in the same colored bags you win up to 25 Free Games or up to 500x the bet in instant prizes! During Free Games prizes are tripled. Casino bonus available to try new game from Realtime Gaming. RTG launched a new mobile slot game launched today as well and you can play it in the Grande Vegas Mobile Casino. Achilles takes bets from one cent up to one hundred dollars per spin. It follows Achilles on his quest to win back the lovely Helen of Troy from Trojan enemies. Grande Vegas Casino has a huge selection of online casino games from Realtime Gaming (RTG). Bringing a taste of Las Vegas to homes around the world for many years, it now offers many of its most popular games in its mobile casino.